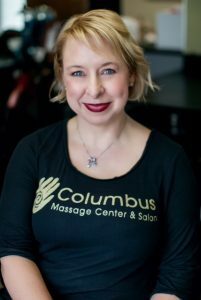 Having received professional training from spa instructional centers in Chicago, New York, and Canada, I’ve enjoyed a career as a licensed massage therapist (L.M.T.) and cosmetologist for over 25 years. To keep current on modern techniques, I attend 3-4 trainings each year at various locations, bringing cutting edge methods and practices back home. Our services focus on sports rehabilitation, yet also provide Swedish style relaxation techniques, and we are prepared to rejuvenate your body proactively and infuse wellness into your schedule and your lifestyle. I’d love to serve your needs for either a great look or relaxation through therapeutic massage. Please call today! The glass is half full. The glass is half full – always. Life is full of blessings, it has meaning, and we are all here together. Let’s make the most of it by helping one another see silver linings and improve our outlooks. We will impart this energy into the treatments we provide you, every time. Every visit you schedule with us will include a personalized plan, including your detailed directions to us, and our exquisite provision of care and physical attention. Whichever spa treatment you desire, your service will be exceptional, each time. We take our responsibility of rejuvenation very seriously, and it is our job to get you on the road to recovery expeditiously. Whether we are restoring your mind, spirit, body, or style, we will do so with an intention that energizes your entire being. You will feel recharged and more confident after treatment. The processes we emphasize at Vickie’s Salon drive the spirit of every client we serve. We are in the business of Beauty, and it is our aim to beautify every client. While each of us is already beautiful, our mission is to amplify this essence in you to the full. Please schedule a visit soon!